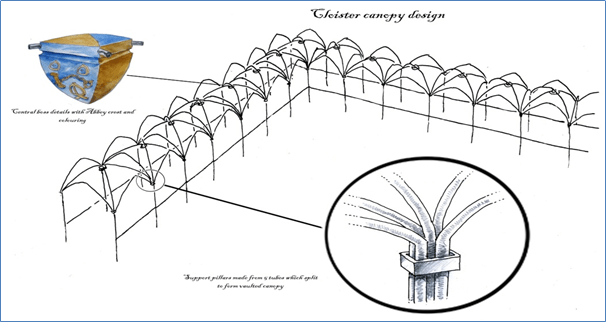 The development of the cloister garden is a project within the overall Evesham Abbey programme. The purpose of this particular project is to transform this specific site – the location of the original cloisters of Evesham Abbey – into a public garden inspired by and evoking those original abbey cloisters. Much of the original cloisters were constructed by Abbot Adam (c.1161); with stained glass and other features being added by later abbots. The new cloister garden is intended to be a place of peace and reflection. 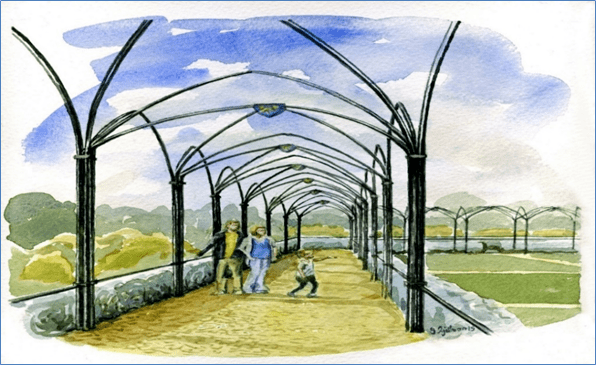 A cloistered walkway will be created on the plan of the original cloisters. 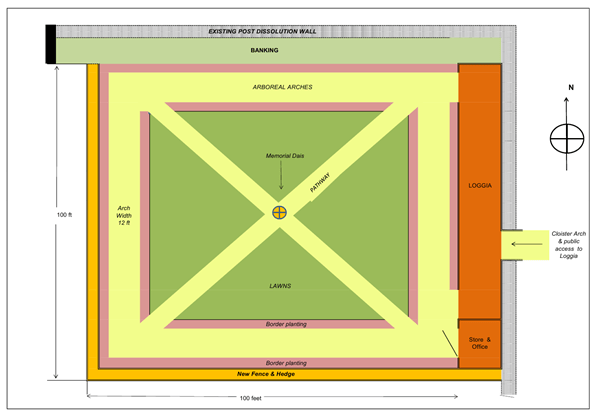 An initial draft design has been prepared which has a central lawn surrounded by steel-framed Gothic arches. These arches will serve as an arbour for climbing plants including wisteria, laburnum and clematis. A low planting of lavender could delineate the peripheral gravel walkway from the central lawned area. Four walkways lead to a central paved area in which stands a feature commemorating the First World War, the activities of Abbey Manor as a wartime hospital and the dedicated public service of Florence Haynes Rudge as its Commandant. The eastern range of the cloisters occupied the strip of ground immediately to the east of the Evesham Abbey site. 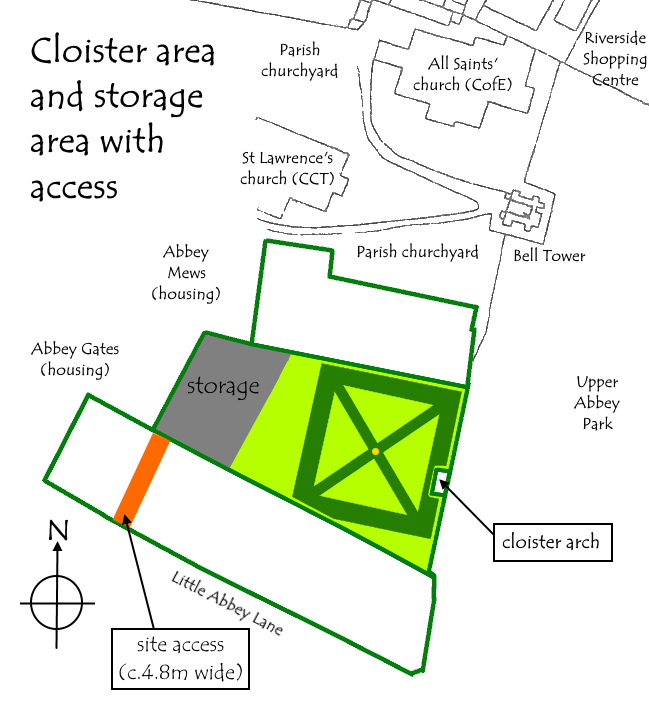 The layout of the abbey churches of Pershore, Tewkesbury, Gloucester and Worcester show varying cloister lengths, and differing relationships between the size of the cloister and the size of the church building. When the garden is mature the effect will be to have avenues of flower-filled shade. The steel ribs of the arbour will rise to a central boss; and this junction point will have a shield affixed below the boss which can display heraldic devices connected to the history of Evesham (such as the arms of the Abbey, the emblem of Simon De Montfort, the arms of the town council, local schools and organisations). It is intended to use the cloister arch as the main public entrance to the cloister garden and the site. The arch is in the care of Wychavon District Council. Detailed discussions have been held with officers and councillors at Wychavon regarding these detailed plans. Once the nave garden has been developed, there will also be public access leading from the cloister garden into the nave garden. The rich colours and complex design of medieval stained glass might be evoked by rich mixes of colour in the planting, or evoked by using coloured glass elements in the design, or perhaps in many other ways. The final design of the cloister garden has not been determined. Instead a series of design principles and guidelines have been laid out; with a view to inspiring creativity to create formal planting, structural elements and a rich colour scheme. George May, A descriptive history of the town of Evesham (Evesham: Vale of Evesham Historical Society, 2007 reprint of 1845 original), p.25. WR2687, ‘Report on Geophysical Survey: Evesham Abbey’ (report number 94/95), work undertaken by Geophysical Surveys of Bradford (project coordinator D. Shiel) on behalf of Hereford & Worcester County Council. Note figure 5. J. Sayers and L. Watkiss (ed. and trans. ), Thomas of Marlborough, History of the Abbey of Evesham (Oxford: Oxford University Press (Oxford Medieval Texts), 2003), p.495 (item 525). Thomas of Marlborough, ibid., page 187 (item 182).